Nintendo President Satoru Iwata believes the company has proven that there's still a market for dedicated gaming handheld hardware like the 3DS. 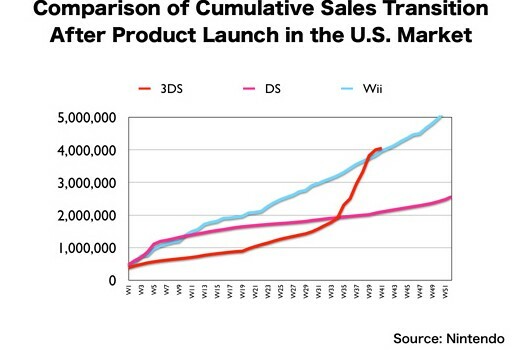 In a briefing -- which covered a lot of ground -- Iwata revealed the pictured chart above, comparing internal Nintendo weekly sales data of the Wii, DS and 3DS. The executive said that the initial sales pace of the 3DS was "unsatisfactory," but the device gained momentum after the price cut and the launch of popular titles like Super Mario 3D Land, Mario Kart 7 (and Monster Hunter 3 (Tri) G in Japan). "Last summer, when the sales pace of the Nintendo 3DS was slow, there were extreme remarks saying, 'With the penetration of smartphones, will there still be a market for handheld hardware?,' which was almost equal to 'Handheld hardware is not necessary anymore,'" Iwata remarked. "I believe we proved that such opinions are incorrect." In the end, however, Nintendo did not reach its internal sales goal for the device, despite the 3DS gaining momentum and ending the year with a respectable 15 million unit sales. Iwata says the company could not cover the lack of units sold pre-price drop, which is one of the reasons for its negatively revised financial forecasts.